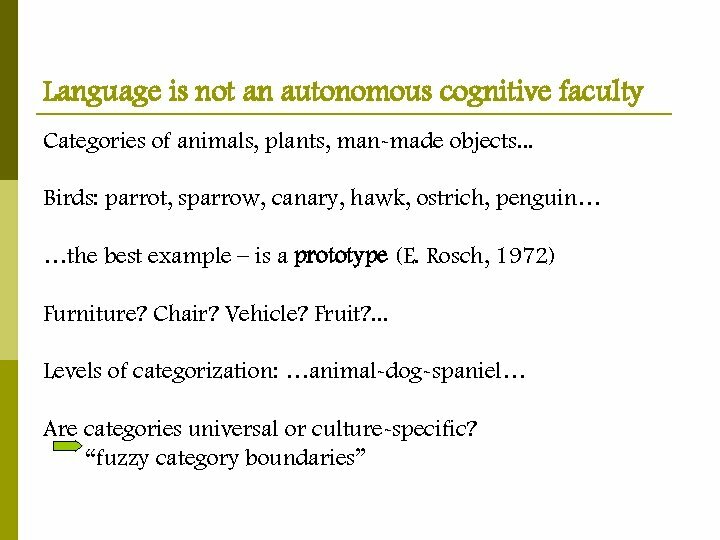 Language is not an autonomous cognitive faculty The act of Categorization is mental process of classification; its products are the cognitive categories. 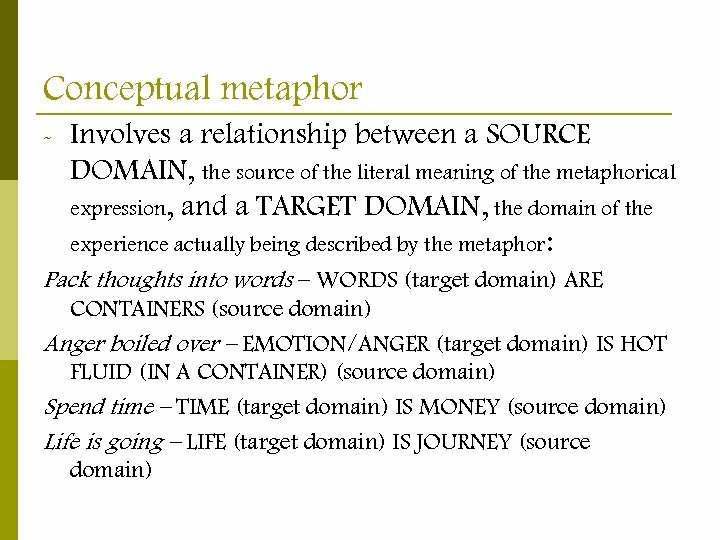 - Applying a word, morpheme or construction to a particular experience to be communicated, it involves comparison of the prior experience, judging it to belong to the class of prior experiences to which the linguistic expression has been applied (W. Croft & D. A. Cruse, 2004). 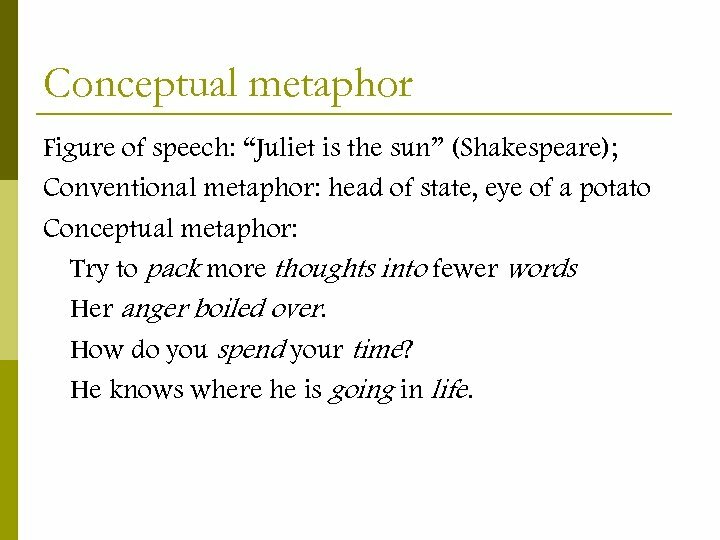 Conceptual metaphor Figure of speech: “Juliet is the sun” (Shakespeare); Conventional metaphor: head of state, eye of a potato Conceptual metaphor: Try to pack more thoughts into fewer words Her anger boiled over. How do you spend your time? He knows where he is going in life. Other examples - He exploded with laughter. with - She trembled with fear. 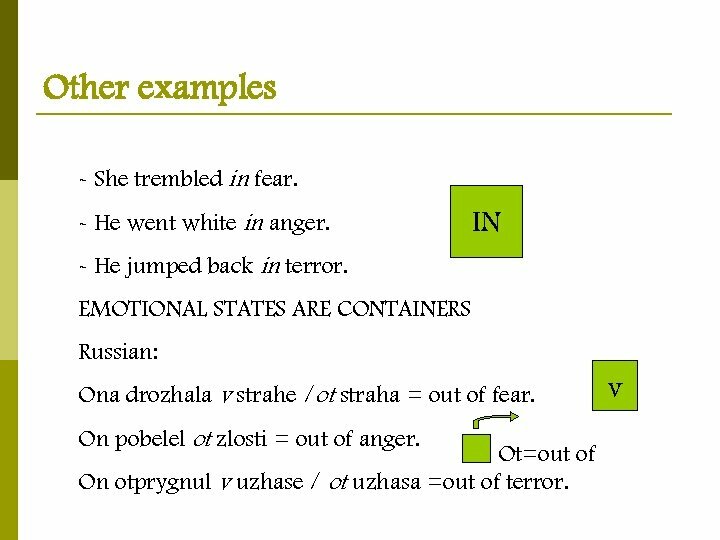 ATTENDANT EMOTION/EMOTION IS A COMPANION Russian: - On razrazilsa smechom. 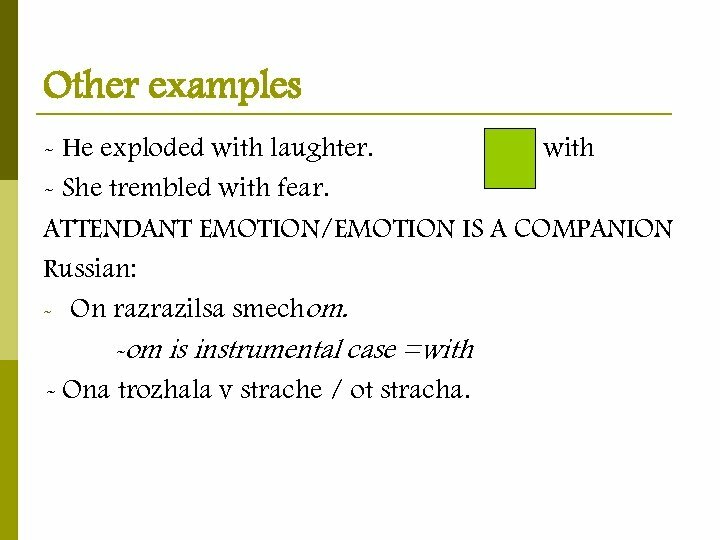 -om is instrumental case =with - Ona trozhala v strache / ot stracha. III. 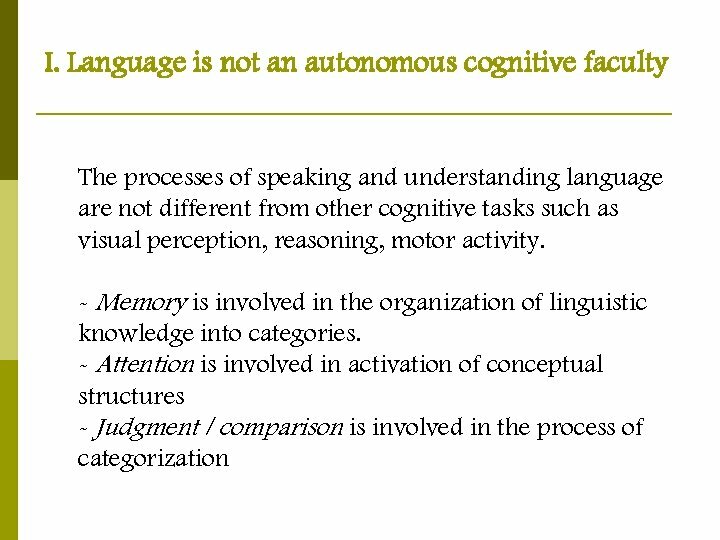 Knowledge of language emerges from language use Categories and structures in semantics, syntax, morphology and phonology are build up from our cognition of specific utterances on specific occasion of use. 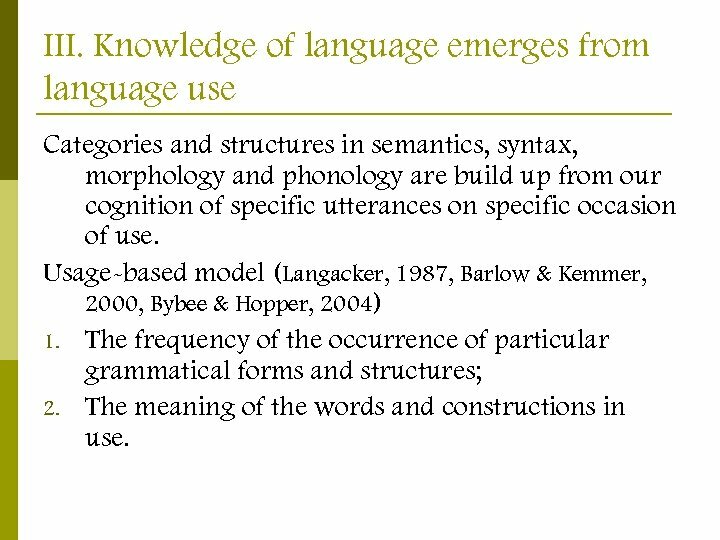 Usage-based model (Langacker, 1987, Barlow & Kemmer, 2000, Bybee & Hopper, 2004) 1. 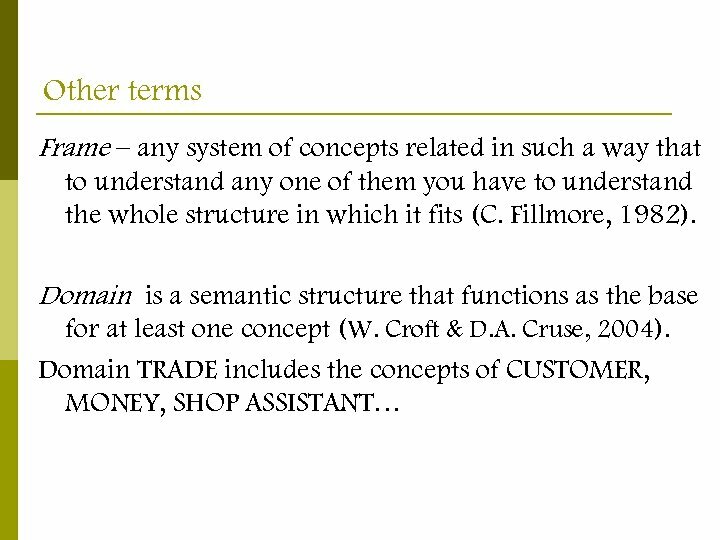 The frequency of the occurrence of particular grammatical forms and structures; 2. 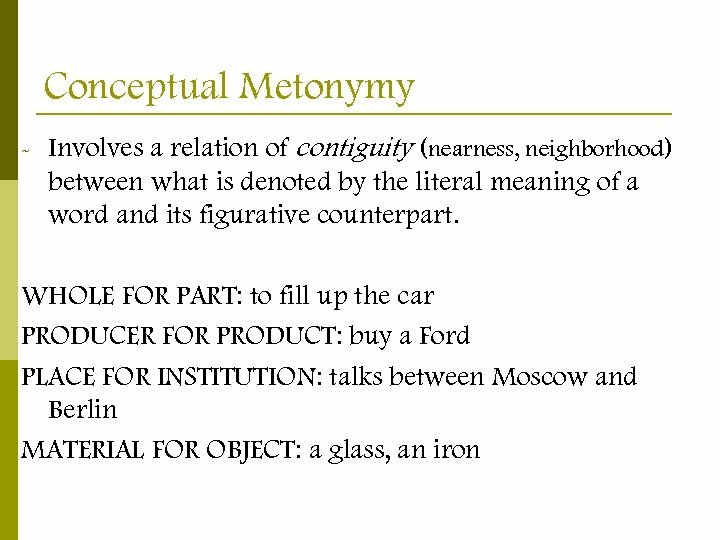 The meaning of the words and constructions in use. Conclusion 1. 2. 3. 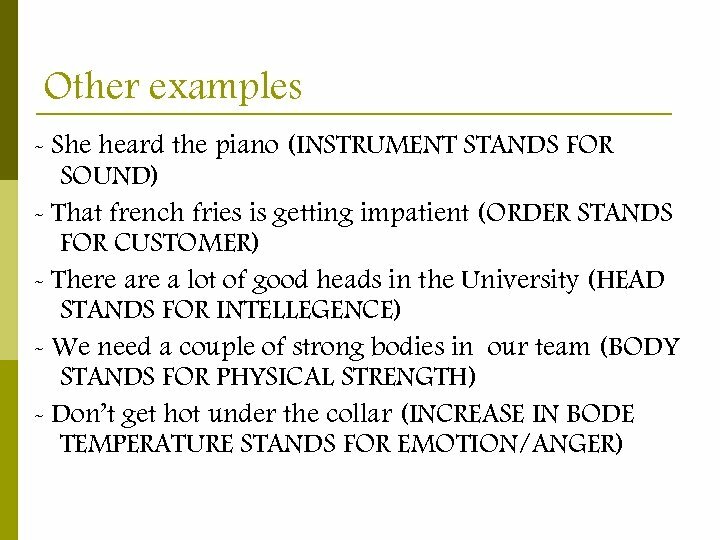 What the words of a given language mean and how they can be used in combinations depends on the perception and categorization of the real world around us. 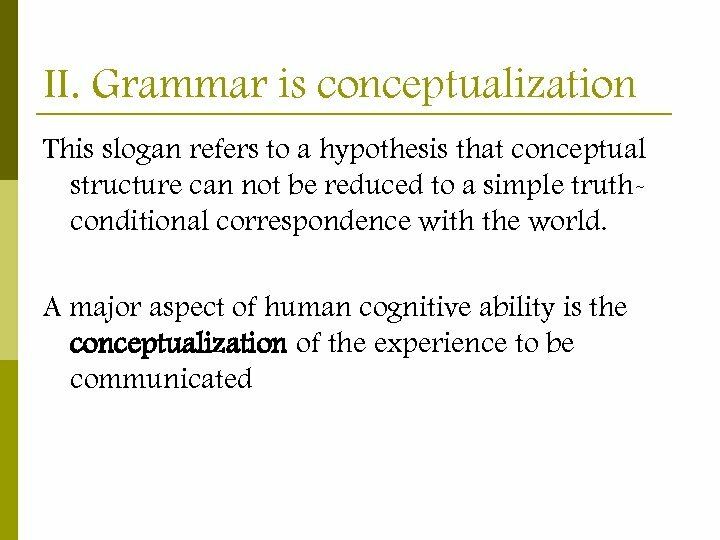 Conceptualization can be found on all the levels of a language. 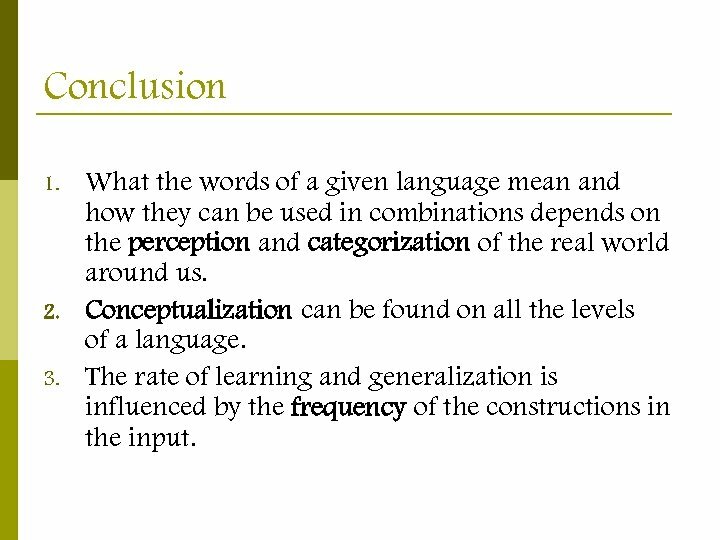 The rate of learning and generalization is influenced by the frequency of the constructions in the input. References 1. Ungerer F. , Schmidt H. -J. 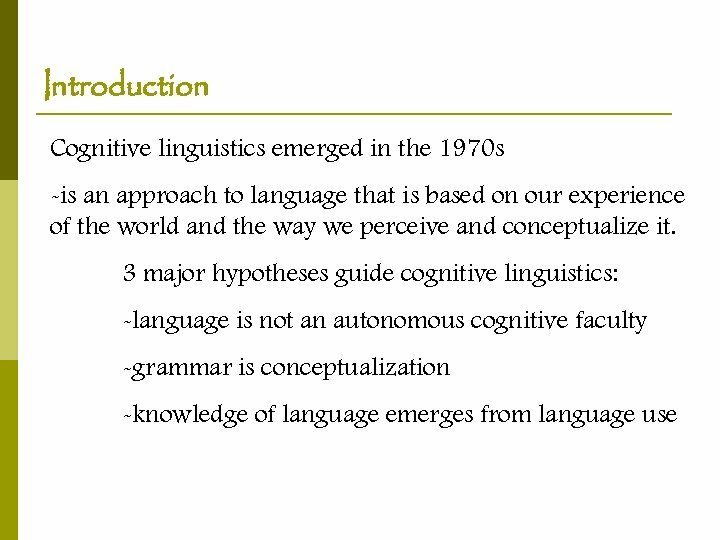 An Introduction to Cognitive Linguistics. Longman, 1996. 2. Croft. 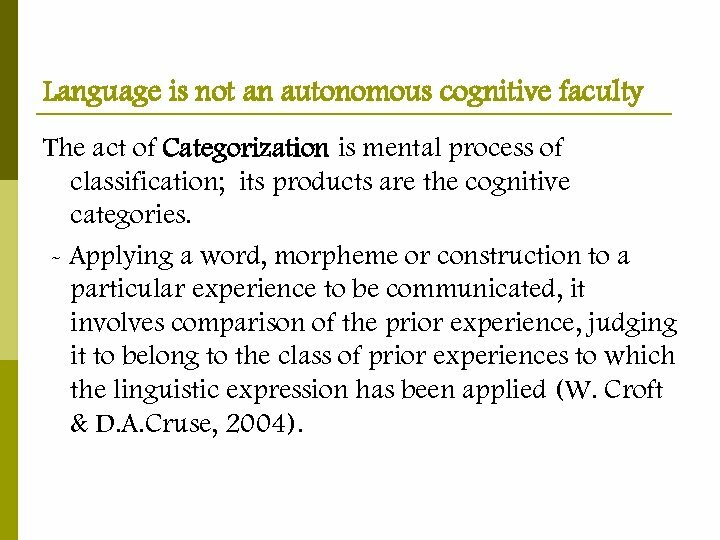 W. , Cruse D. A. Cognitive Linguistics. 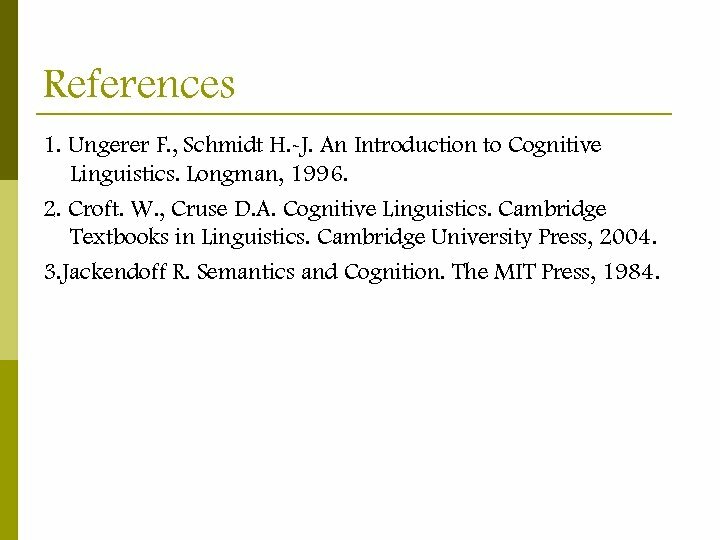 Cambridge Textbooks in Linguistics. 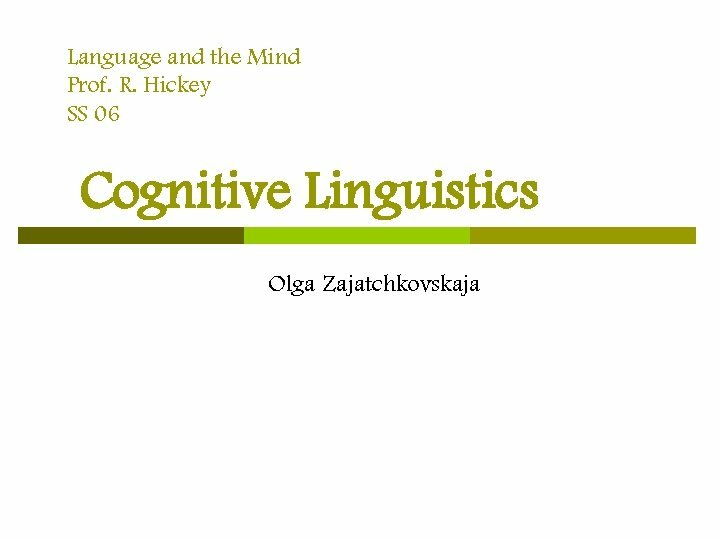 Cambridge University Press, 2004. 3. 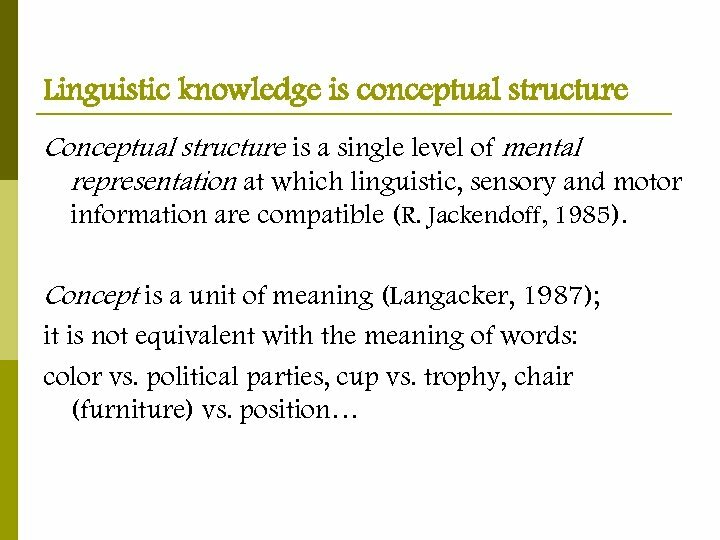 Jackendoff R. Semantics and Cognition. The MIT Press, 1984.